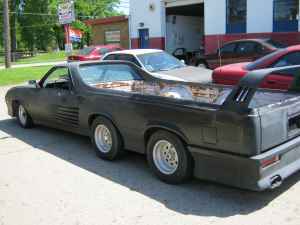 AllCamino is now listed at GoHyperlocal.com! GoHyperlocal is a blog about producing and improving hyperlocal news web sites and it features a listing of such sites throughout the U.S. and U.K. I submitted AllCamino for their consideration and happily it was accepted. Here’s my listing. “Hyperlocal” refers to the growing trend where news stories are being reported and published from and about small well-defined geographic regions such as cities or even neighborhoods. It contrasts with traditional media outlets which don’t have the bandwidth to report down to the same level of focused detail. The hyperlocal trend is yet another area where technology and the internet are democratizing the flow of information and putting powerful communication capability in the hands of individuals. Speaking of maps, GoHyperlocal maintains a Google map which pinpoints all their listed sites. It was a challenge for me to pick a single coordinate to represent AllCamino but I decided on 500 El Camino Real, Santa Clara. That’s the address of Santa Clara University and I picked it because the immediate area contains so much of what AllCamino is about. There’s a mission, a university with athletic, cultural, and academic venues, a train station with a museum, and a transit center. There are residences nearby, businesses, and retail. It has it all. Even a bell. On a personal note it’s also pretty much the closest point on El Camino Real “proper” to my house. GoHyperlocal is run by a fellow named Chad. He doesn’t just list other sites. 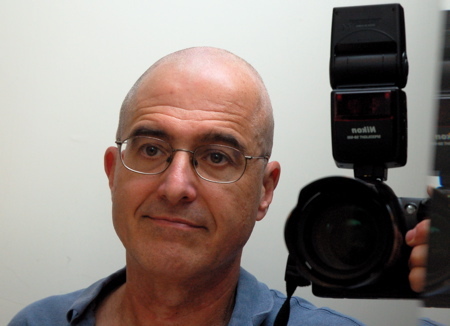 He posts articles useful for the hyperlocal blogger such as story ideas, journalism principles, and critiques of what works and doesn’t work on hyperlocal sites. Surprisingly Chad doesn’t run a hyperlocal site himself. He started GoHyperlocal as a way to combine his interest in web technology and his background in sports journalism. He says of local sites, “They’re a much better way to get to know a place and its people than reading about it on some travel site or even in their city newspaper.” It’s meta-tourism. 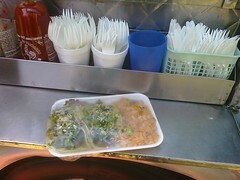 I found GoHyperlocal when I was searching for other local blogs that encompass El Camino. 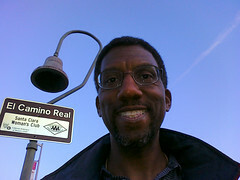 I turned up the excellent InMenlo.com which is all about Menlo Park and Atherton. 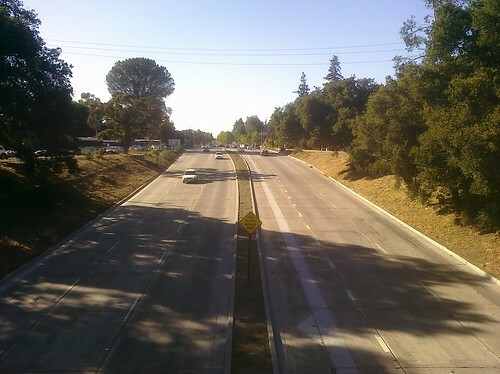 InMenlo is also listed at GoHyperlocal so one click led to another and here we are. GoHyperlocal is always looking for other suitable sites so if you know any, be sure to submit them. I’ve written about Treatbot a few times, San Jose’s own Karaoke-enabled ice cream food truck. We first learned of them in April at Calvin’s Second Anniversary celebration. I’m not normally very observant but I surprised myself by noticing that the address printed on Treatbot was the same as Calvin’s! 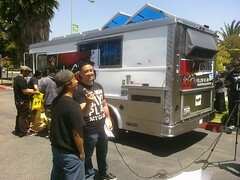 Ryan the owner explained to me that food vans need a permanent address, so his is Calvin’s. 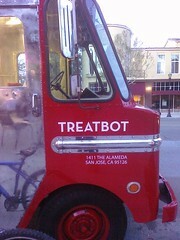 Personally, I think Treatbot just wanted the upscale The Alameda address. I was very impressed by the whole conceptand the ice cream sandwichbut I was soon to learn it was just the tip of the iceberg. MoGo BBQ Lunch time! 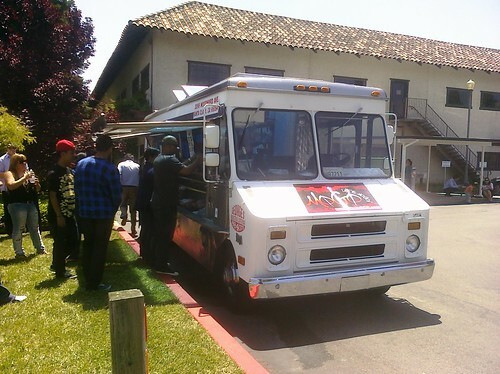 Join us for lunch 12pm at 399 S main st milpitas! Come out be featured in PACMAN”S 30th anniversary video! they will be giving out free stuff today and cool PACMAN gear! I like lunch, I like Pac-Man, and I work in Milpitas, so at the appointed hour I was there. That’s when I learned about MoGo. Like Treatbot they are a new-wave mobile food vendor. MoGo serves up Mexican-Asian fusion cuisine such as Kimchi Quesadillas and Tofu Burritos. I tried a couple pork tacos with MoGo vinaigrette with a side of Kimchi rice. Very tasty. A coworker told me that these gourmet food trucks are very popular in Los Angeles and now they’re on the rise up in the Bay Area. They can be found all over the country. They even have their own elimination-style road trip reality TV show, “The Great Food Truck Race” with Tyler Florence on The Food Network. Obviously food trucks have been around forever, known colloquially by an unflattering rhyme I won’t repeat here (hint: it’s not “broach poach”), but they’ve always been plain unimaginative affairs, more a convenience than a culinary experience. This new generation has found a formula to energize the whole concept of meals on wheels. The first element is food with a hook. Treatbot sells locally-made hand-scooped ice cream, not packaged frozen novelties like your typical music-box-cranking ice cream truck. MoGo and Bulkalbi have the Mexican-Asian fusion thing going on which is exotic even in multicultural San Jose. Other trucks go high-end, serving dishes you’d normally only find in fine restaurants. The second element is marketing. Each truck works hard to create a unique identity and memorable customer experience. Treatbot…Karaoke…say no more. They have clever names, flashy paint jobs, and bubbly servers. They’re most known for using social networking sites to attract and retain clientele: Facebook, YouTube, Yelp, you name it. (Humorously their mobile nature defeats Foursquare; it can’t keep up.) I follow them all on Twitter and let me tell you, when I get that daily deluge of lunchtime locations and menus du jour, it gets the juices flowing. Last week three of them showed up within walking distance of my job on three different days; I took the bait and ate at all three. Let me know if I missed any. I haven’t tried them all yet, but I will. I know where to find them. Naturally these trucks often find their way to El Camino Real. Heck, Treatbot lives there. 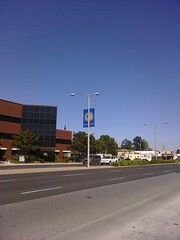 The MoGo Pac-Man event was on Main Street in Milpitas. It’s not an opening at The Usuals unless Treatbot is there. A few nights ago MoGo and Curry Up Now were both on El Camino at the same time for dinner, a couple miles apart. They know what’s up. Here’s what I really like about these trucks: when they show up, they create an event. Namco chose to tag along with MoGo, tapping into some street excitement to celebrate Pac-Man’s 30th anniversary. They filmed this video behind the truck. It works both ways; the trucks go where the action is, often in pairs. Bike Party, National Night Out, festivals, holidays. Social networks in tow, every time they park it’s an instant meet-up. I feel were right at the beginning of this movement and I wouldnt be surprised to see an explosion of variety in the next couple years. Theres plenty of room for innovation too. This is Silicon Valley. How about online ordering? GPS tracking? Electronic payment? Alternative fuel vehicles? (Treatbot is propane-powered!) Um…chairs! The sky’s the limit and the road is open.